Hey boys, have you heard about the new shape in bags? It’s not the messenger, the tote or the backpack, but the DUFFLE. 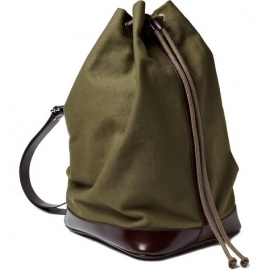 Get into this utilitarian military inspired bag. I love the olive green cotton canvas with the rich chocolate leather trim. This bag is great for the beach, the track, the gym or the field. No need to hunt anymore for a new chic bag, go to Mr. Porter.com and shop the brand APC who are known for clean designs made out of sturdy quality materials. I’m ready to sign up! This entry was posted in Must Have Now!. Bookmark the permalink. Ugh, stop making me love this bag – What am I going to do with my twenty other bags!!?? And what are you going to do with you 99 other bags !